TTC Sheppard Yonge Station: You may have been to this station before, you may not have been but chances are decent that if you live in Toronto you’ve ridden on one of the subway lines which attach to it – the Yonge-University-Spadina (YUS) Line and the less used Sheppard Line. As you can see in the picture above when you are walking throguh the subway station you are advised by a directional sign what the escalators and stairs in front of you lead to. The folks who wrote this TTC signage decided to indicate to travelers that at the bottom of these steps can be found “Yonge Trains and Sheppard Subway.” Wait, what? What’s the difference between the two subway lines aside from the obvious answer that they service different areas of the city and one’s a north-south line while the other is an east-west? 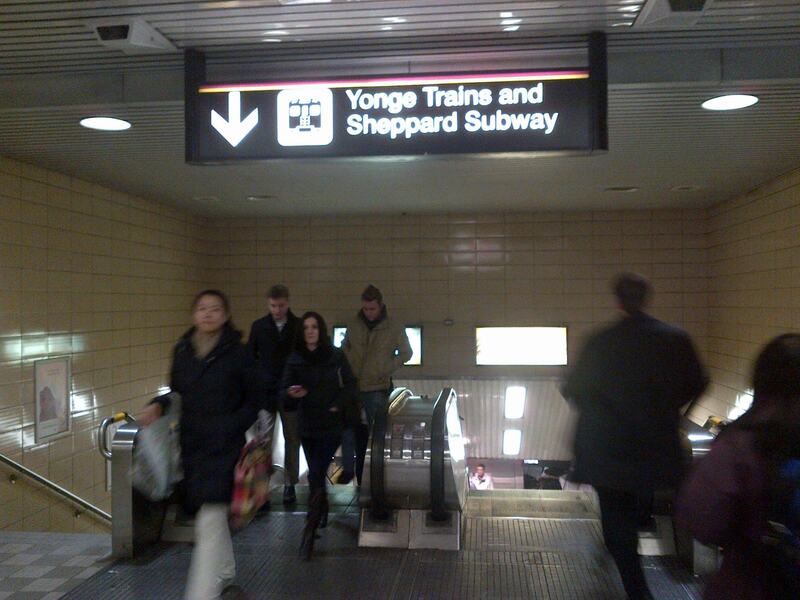 Why is the Yonge Line referred to as having ‘trains’ and the Sheppard Line as being a ‘subway’? Is the idea to confuse commuters, people new to the city, and tourists? If so, they’re probably doing a superb job! Seems that in the City of Toronto our public transit does not only have subway lines, streetcars, buses, and the Scarborough RT cars but we also have a fifth option – trains! But hold on a second…don’t GO, VIA Rail, and the like run the trains? Aren’t trains intercity not intracity? Why the confusing descriptors TTC? Why? The YUS and Sheppard Lines both run the same subway trains in the T1 so there is no difference there. (although the YUS Line also has the Toronto Rocket as well as the older H5s running on it, the latter of which are slated to be sold to Eko Rail of Lagos, Nigeria in the coming years.) In fact, the only difference I can think of between the two lines is that the Sheppard Line remains underground for its entire length whereas the YUS Line comes above ground for a fair portion of its route. Does that make it a train and not a subway? I have never heard or seen of it referred to as anything but a subway and this sign just seems so weird. I wonder why the TTC has chosen to compose the sign this way. It just seems odd and silly to do so as well as unnecessarily confusing. Until I hear otherwise I am classifying this as an epic FAIL on the part of the TTC signage team. There’s bad signage which is what it is because it’s illegible or badly placed or not lit up or simply not present and then there’s this. This goes beyond being bad signage to the point of being confusing signage which works against the smooth flow of urban passenger traffic on mass transit. If anyone knows the answer for this, I would love to hear it. I assume – or rather I hope – there must be a rational explanation for this. Then again, it is the TTC. 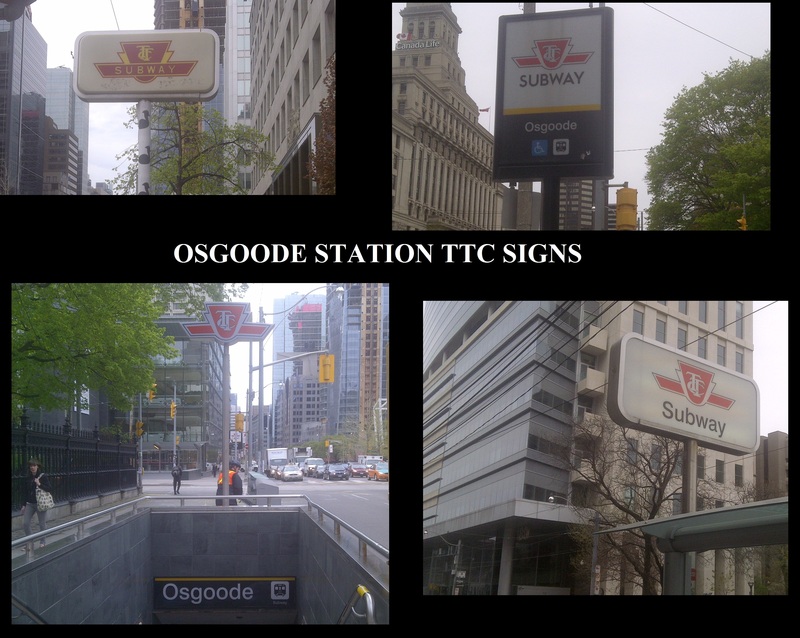 TTC Signs – 4 Different Ones For Osgoode Station! What The…? Osgoode Station is at the corner of Queen West and University Avenue. The other day I noticed a new type of TTC sign indicating there was a subway station entrance nearby. It was then I noticed that at these street corners there were FOUR DIFFERENT TYPES OF SIGNS marking this stop. Granted, they all have the same basic TTC logo on them but honest what the heck is going on? Shouldn’t those of us on the look out for a subway station (especially tourists or people new to the city) only have to keep our eyes peeled for one sign which is one shape? Sure the newest type of sign (bottom left corner in the picture above) is pretty cool I’m not gonna lie. But this signage is terrible and just looks like a mishmash of eras. The top left sign and the bottom right sign were on different poles to be honest BUT the bottom right sign’s other side had the same exact older style logo as the one shown in the top left corner. Honestly, what the heck is going on? Someone needs to get on this and fix this. That’s my $0.02 anyway. What do you think?